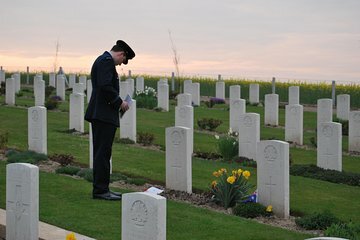 Commemorate the sacrifices of Australian and New Zealander soldiers during World War I with the annual ANZAC Day Dawn Service in Villers-Bretonneux. On April 25, Depart Paris in the early morning hours to arrive in time for the dawn vigil. Continue on to the surrounding countryside for a tour of the pivotal Somme battlefields with your historian guide. Visit landmarks and memorials including the massive Lochnagar Crater, the Franco-Australian Museum and the Adelaide Cemetery on this enlightening and emotional full-day tour. Observado todos os anos em 25 de abril, o ANZAC Day comemora o início de uma grande ação militar do Exército Australiano e da Nova Zelândia durante a Primeira Guerra Mundial. Nesse dia de 1915, as forças ANZAC desembarcaram em Gallipoli e iniciaram uma campanha contra os turcos otomanos que resultou em baixas maciças de ambos os lados. Descanse em uma partida de manhã bem cedo de Paris, onde você encontrará seu guia na Ópera Garnier às 2h da manhã para as aproximadamente duas horas de carro até a cidade de Villers-Bretonneux. Quando você chegar, testemunhe a homenagem anual aos soldados da ANZAC com um serviço militar da madrugada. Depois, embarque em uma excursão pelos locais da Primeira Guerra Mundial na zona rural circundante, incluindo os campos de batalha de Somme, onde algumas das campanhas mais sangrentas da guerra aconteceram. Ao longo do dia, o seu guia especializado irá compartilhar o histórico dos sites que você visita e fornecer contexto para a enorme complexidade e perda de vidas durante os dias sombrios da Grande Guerra. Maravilhe-se com a gigantesca cratera de Lochnagar em La Boisell e honre os soldados da Commonwealth no Cemitério de Adelaide. Preste suas homenagens no Memorial Thiepval e navegue pelos artefatos de guerra no Museu Franco-Australiano. Todas as taxas de transporte e de entrada estão incluídas, e você terá a chance de comprar o almoço no meio-dia do restaurante local. Sente-se e reflita sobre o retorno para Paris, onde você será deixado no ponto de partida original por volta das 15h30. Loved this Tour, was pricey, but money well spent. Picked up at midnight and driven to Villers-Bretonneux for the transfer to the Dawn service, given a gift package that had some light brekkie. After Dawn service we went on a day tour of the battlefields. Nicola the guide was extremely knowledgeable, and loved to talk, we all loved to listen, when someone knows what she does, why wouldn't you listen. Don't hesitate to book these guys, it is well organised and a great day, with other like minded individuals for the day. My husband and I went on this tour to Villers Bretonneux for the dawn service on Anzac Day, 2016. We met up with our tour guides Nicola and Regis at Opera Garnier and left Paris at 2.15am. When we arrived at Villers Bretonneux the tour guides provided us with ponchos, croissants, orange juice and water along with information on the order of service. On arrival the security was understandably strict after which each person was given booklets and 2 pins for the service. The Dawn Service itself was a very moving experience. After the Service there was a wait for each tour bus to be called in turn because there were a lot of people and tour buses! Our tour then continued on to visit a few of the battlefields and memorials with Nicola and Regis who were very friendly, efficient, knowledgeable and informative. This is a must-do tour for Australians and New Zealanders but wear a lot of warm clothes and a waterproof jacket - we were lucky it didn't rain. It was zero degrees Celsius during and after the Service. We returned to Paris at 3.45pm after a very satisfying day. We also did the Villers-Bretonneux tour in April 2016 and Lynettes comments earlier are a very good description and sum up our experience exactly.Recommended. Great tour, very informative, hosts great, weather let us down, although can appreciate what it was like in 1915. A bit of a wait for buses to pick us up after the ceremony. Well worth the early start and a full day worth of activities. The tour guide Bertrand was very knowledgeable and had a fantastic sense of humour. The day itself was quite emotional and filled with fantastic stories, sights and plenty of dr8ving.